I am in empathetic mode tonight. I feel for everyone who can’t sleep because Cheltenham could be off because of Equine Flu (it won’t be), for the Inland Revenue who now miss out 12.5m pounds because Ken Dodd got married 48 hours before he died, for people who had to look at the fat guy wearing an Hawaiian shirt, shorts, white socks and sneakers on last night’s flight (although that could be self pity). I don’t feel sorry for Melania; well, not yet, but I feel even that could be creeping on. But the person I feel most sorry for is the Irish handicapper; apparently he is a complete idiot (and his English counterpart isn’t far behind). Let me be absolutely clear here: I do not think he is an idiot but it is obvious that most Bookmakers absolutely do. Let me explain what I mean and why he will be watching the 1.45pm race from Punchestown through his clenched fingers; trying not to look but drawn to the disaster about to unfold like a moth to a flame. Bay of Freedom is the cause of this potential anguish; a horse who has shown half decent from at times but has , let’s be honest, been disappointing for a few runs now. Bay is running in this race and, based on his handicap rating he has an outstanding chance; the problem is: based on the bookmaker’s opinions he has absolutely no chance. So who is right and does any of it make any sense? Let’s dig a little deeper. The handicapper thinks., at tomorrow’s weights that Bay has 16 pounds in hand of A Sizing Network, 18 pounds versus Behind Time and no less than 43 pounds in hand of Mtada Supreme. Any rational handicapping view would have Bay of Freedom finishing well in front of all three. Why, then, do the bookies price Bay at 33/1, A Sizing Network at 10/1, Behind Time at 8/1 and most egregiously and insultingly Mtada Supreme at 14/1? Someone has got it wrong and we will find out before 2pm tomorrow! Now here’s little story for you. I think by now you all know how much I love Ireland and the Irish people. One of the main reasons for that is their openness and fairness. A few weeks ago, when the detailed race conditions came out for tomorrow’s race, there seemed to be a mistake; penalties were earned for any wins since 1/1/16 when in previous years the comparable date would have been 1/1/17. This was important because Bay of Freedom had won two races in 2016 (none since) and this would have meant a 10 pound penalty. Normally, I would have called Peter and asked him to check into it but he was over in Australia so that wasn’t an option; I also didn’t want to drop this on him as soon as he got back but it was time-sensitive so I took the initiative and wrote to the head of Race Planning at Horse Racing Ireland, Shane Doyle, querying the conditions. You can click on the correspondence here. Shane responded inside 60 minutes, thanked me for bringing it to his intention and stated that the race conditions would be altered before the entry stage; which they duly were. The difference between this response and what I would have got from the British Horseracing Authority (had I have been foolish enough to reach out to them in the first place) is night and day. Whatever happens tomorrow, I am very grateful to Shane and his team for their humility and grace. Getting a jockey for tomorrow proved a problem. Roger Loughran announced his retirement on Friday (more on this below), several jockeys are suspended and we really wanted a good horseman and, ideally, someone who could school him this week. I am very pleased to have Phillip Enright who is a good horseman but, unfortunately, he has been unable to school the horse as he lives in Cork (two hours away). We had hoped that he could come up early and school this morning but that didn’t work out. Bay of Freedom, however, was schooled over the course yesterday and jumped 10-12 fences included the big drop fence and a double bank; he enjoyed himself and seems all set for tomorrow. The big thing is for Phillip to get confidence quickly in the horse (and not to try and organize him too much). Peter’s job is to instill that confidence while also saying that his worse jump is likely to be the very first jump as that is a regular hurdle and , for whatever reason, these smaller obstacles are the ones he jumps worst. I am all set both mentally and sartorially. Some of my great racing friends sent me a surprise gift as a thank you for several great days out following Bay. I was surprised on two fronts: that they bought me anything and that they thought we had had some great days. But, hey, they were always easily pleased. 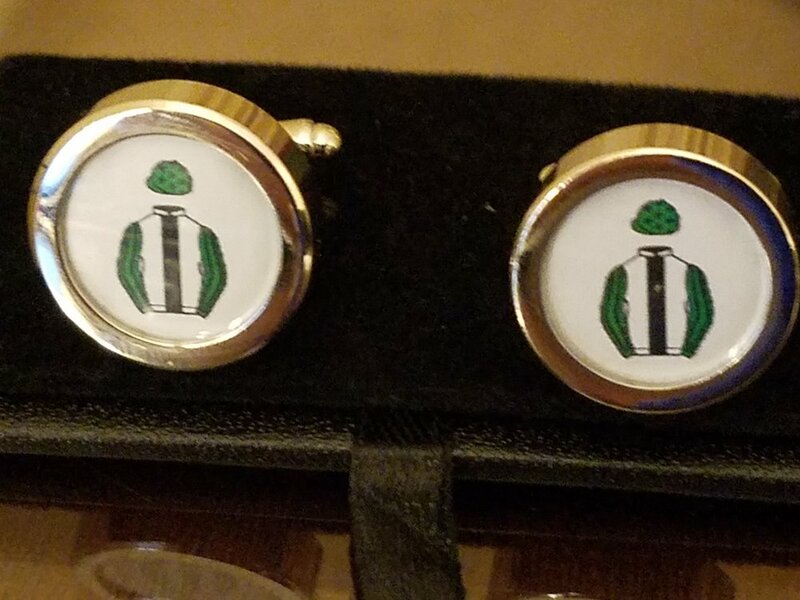 The gift was a set of cufflinks in my racing colours and they will be proudly displayed tomorrow on my newly acquired French cuffed shirt. They are very cool! Back to Roger: he is a very likeable guy and I have seen him several times on the Curragh and have had a few pints with him over the last four years (not as many as Peter who is a good friend but enough to say something on this blog). One story he told me, which is probably true of most jockeys, is that, after years of hot baths to sweat the pounds off, he is now unable to run a bath without spontaneously breaking out in a muck sweat. It is probably a good job that he will be concentrating on pre-training horses and not looking to become a private butler to Rich Ricci! I wish him the best of luck and look forward to buying him a pint that he can both enjoy in the moment and not feel compelled to sweat off within 24 hours. Finally, and I very rarely tip horses, but, whatever happens to Bay of Freedom, I am planning to catch the second race (hopefully with a glass of champagne in my hand) and watch Sinoria show just how good she is.